DivX 7 introduces H.264 (MPEG-4 AVC) support, both for encoding files and decoding (playing) them. The Pro version of DivX 7 includes a simple one-click encoder called DivX Converter, which supports a wide variety of input formats and allows you to convert them to various DivX profiles, including DivX HD Plus (H.264). The DivX HD Plus profile uses the MKV container format with AAC audio. This guide shows you how to use the DivX Converter tool to convert your video files to H.264 with AAC audio, and then how to get that file to play on your Xbox 360 or PS3 by converting the MKV file produced to MP4 (without re-encoding). This guide, like the DivX Converter tool, is squarely aimed at beginners. 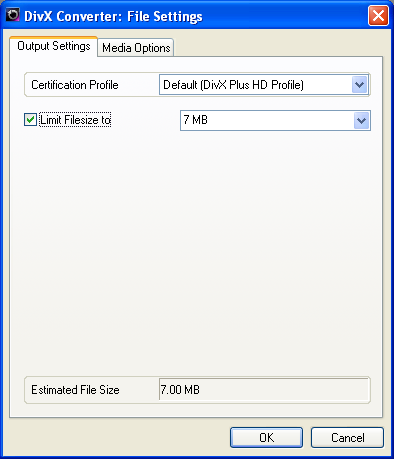 Download and install DivX Pro 7. Start DivX Converter. As you can see, the DivX Converter interface is extremely simply. Right click anywhere within the converter and select "Preferences". Here, you can set some encoding options, the most important being the output folder (by default, it's set to your "My Documents\My Videos\DivX Movies" folder). Press "OK" to close this window when finished. Back to the main DivX Converter interface, first, use the left/right arrows to select the profile to encode to. In this case, we need to select "DIVX PLUS HD". Then press the "VIEW LIST" button to open the file list. Press the "Add" button and add in the video file you wish to convert the H.264. 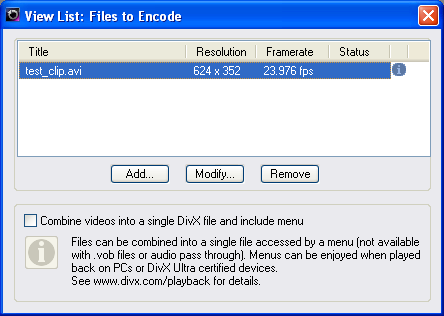 You can load in multiple video files and each will be converted after one another into separate H.264 files, unless you check the "Combine videos ..." option box, then DivX Converter will combine all input files into one output file with a menu to select which segment to play (accessible on the PC or DivX Ultra certified devices, otherwise the file will just play through each segment one after the other). Left click on each loaded file and press the "Modify" button. This brings up the file settings window. Here, we can set a limit to the file size, so that the output file will fit into your storage medium. Otherwise, you can leave the file size up to the DivX encoder, which is not recommended. The estimated file size is shown below, make sure this is what you need (to be safe, you should make sure the file size limit is set a couple of MBs below the actual capacity of your storage medium, as sometimes the encoder can go over the set file limit by a couple of MBs. 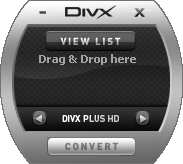 Back to the main DivX Converter interface, press the "CONVERT" button to start the conversion process. The process should take a few minutes to a few hours, depending on the length of your input video - the conversion progress is shown. Once done, DivX Converter will inform you and you can use the "View Files" button to get Windows Explorer to open the folder that contains the output video file(s). We've now got our MKV file with H.264 video and AAC audio. The next page/step will show you how to get this file to play on your Xbox 360 or PS3.